Domtar’s pulp mills are, in essence, biorefineries that separate and extract the natural chemical building blocks of wood. The cellulose that is extracted is used to make paper, but other biochemicals from wood are also valuable as feedstocks for products such as fuels, flavors and fragrances. As Domtar continues to innovate, we are exploring many opportunities in biomaterials. This is one of several stories highlighted in our recently released Sustainability Report. Domtar now has more than 100 options for supplementing and enhancing our current pulp and paper product portfolio with biomaterials. This requires an agile and objective approach to decision-making. The task becomes even more complicated when one considers that each of our pulp mills is configured differently and operates in a different environment using different wood feedstocks. 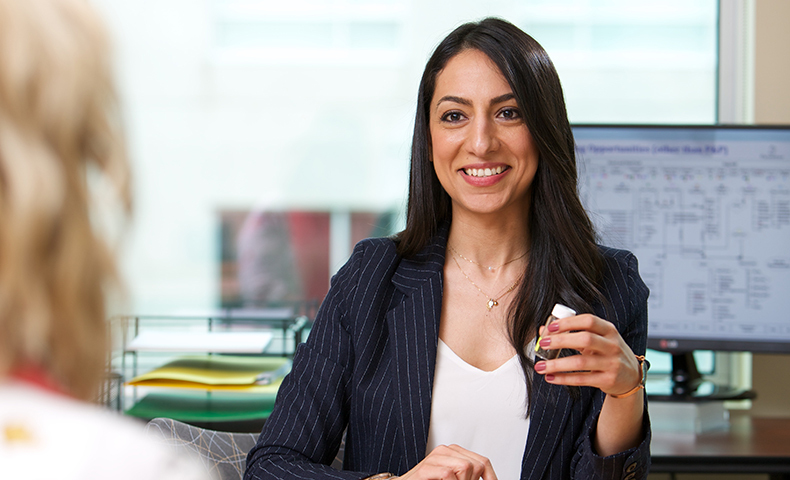 That’s why we’re interested in the science of decision-making, and why we recruited Shabnam Sanaei to bring new thinking to complex decision-making. Before moving to Canada in 2008, Sanaei earned a master’s degree in chemical engineering in Iran, where she studied under professors who work in the oil and gas field. She was eager to pair her learning in that field with her interest in environmental sustainability and biorefining. She enrolled at Polytechnique Montréal for doctoral studies, where her research centered on sustainability assessments and multicriteria decision making. This included developing a model for deciding how to best supplement our current product portfolios at each of our facilities. “I wanted to develop a method to evaluate the sustainability of integrated biorefining and biomaterials opportunities, accounting for the economic, environmental, regulatory and social factors,” Sanaei said. From Montreal, Sanaei moved to Domtar’s Dryden, Ontario, mill to test how her model would work in practice. She then completed a two-year post-doctoral internship at Domtar that focused on lignin valorization. She is now part of our biomaterials business, examining opportunities for new revenue streams across Domtar’s mill system. This includes opportunities like producing a feedstock for making high-strength carbon fiber, or feeding livestock for healthier and more sustainable food production. Her work is an example of Domtar’s approach to sustainability: working smart for the long term.